Our chefs come to your home for a half day every week and completely eliminate the work of planning and preparing meals. What would you do with 10 or more extra hours per week? Unlike meal kit delivery, we customize our service to your family's tastes and dietary needs. Our service starts with a free, in-home consultation where you meet the chef and the chef learns your likes, dislikes and diet restrictions. There are no limited menus. Every menu is customized every week to your unique tastes and requests, creating endless possibilities. We use only local, professional chefs. All our chefs have several years experience in the city's best kitchens and a culinary degree, or have demonstrated comparable skill during our stringent testing. Chefs are all employees of Friend That Cooks and are background checked, bonded and insured through us. Our pricing model is quite simply the fairest way possible to pay for a professional service. Rather than locking you into a subscription or set price per meal, we charge you for the actual service time you use from our chefs, and you provide the shopping money for groceries. Visit the services page for your city for more rate information. "Our life is so much simpler having Laura fix our meals once a week. We always get a variety - and her tomato tart is amazing. This is the best investment we have made." - Val C.
"Our chef, Karie, is amazing! She creates wonderful meals for my elderly mother. It has changed my Mom's life - she is getting so much better nutrition that her health and memory have improved. And of course, she really enjoys the time with Karie too. Thanks so much to our chef and Friend That Cooks for offering this great service at an affordable price." - Terri G.
I'd recommend this to anyone! "Our chef Tyler is fantastic. I absolutely love this service. I can cook, I just don't like to, and I hate to grocery shop. This service has been fantastic because it frees up lots of time for me to devote to work and other things. The food has been fantastic and I have been able to give him guidelines that he easily sticks to, but still gets creative with my meals. I'd recommend this to anyone!" - Melanie S.
Welcome Friend. 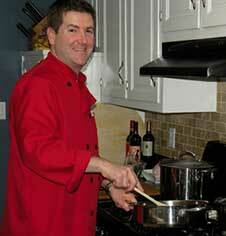 I'm Brandon O'Dell, founder of Friend That Cooks Personal Chef Service. You've found something unique in our company. I started Friend That Cooks in 2007 as a service that improves not only the quality of life for our weekly meal prep clients, but also for our most important asset, our employees. The food service industry has a long history of chewing up employees and spitting them out. Restaurant workers toil nights, weekends and holidays while their family and friends are off work with the majority of society. They often work 12+ hour shifts, missing family get togethers, nights out, and holiday gatherings. For this, they're rewarded low wages, little or no benefits and limited opportunity to advance. I believed when I started Friend That Cooks, there was a better life waiting both for busy families and for talented cooks. I saw a way to improve the quality of life for both by bringing them together. Friend That Cooks is a service that can alleviate one of the most taxing and time consuming activities any of us go through on a daily basis, figuring out what we're going to eat, planning for it, and spending the time cooking or eating out. It's a huge investment of your time, 10+ hours per week. Through solving this problem for families, I've also found a way to solve some major problems for many talented cooks. For those that can prove their skill, we offer a wage beyond what the rest of the food service industry can pay them, and benefits well beyond what any food industry company is willing to pay. More importantly, we offer them nights, weekends and holidays off. Something most have never experienced in their career. We give them a better quality of life. By doing so, I hope to pressure the rest of the food service industry to do their part to improve their employees' quality of life too. If you're up for it, and in need of some better quality of life yourself, you can help me in my mission. Let us alleviate the 10+ hours per week you spend planning, shopping, cooking, and cleaning up. We can do it a LOT faster, and a lot better than you can, and we love to do it. Try out our service with no commitment and no contracts. If we don't place you with a chef who you feel is a true Friend, we will find you a different one, or you're free stop service with no further obligation. I'm very proud of what my team and I have accomplished at Friend That Cooks, and we have many, many happy families who are now Friends and love being a part of what we do. Let me make you one of them. Improve My Quality Of Life ! !